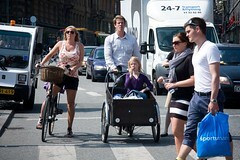 It's quiet in Copenhagen at the moment, during the three weeks of summer holidays. 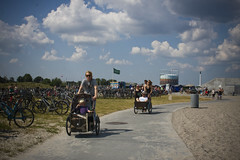 The numbers of bicycle users heading to and from work are still mind-blowing to visitors but it is clear to those of us that live here that most of the nation are holidaying at home, in their summer houses or off travelling. 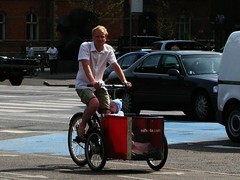 Cargo bikes and Copenhagen are like a hand and a glove. 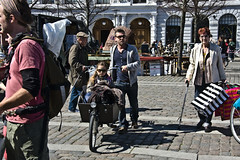 With 40,000 cargo bikes in the city you're certain to see them everywhere. In the summer holidays the pace slows. 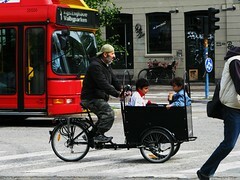 Kids don't have to be transported off to kindergarten or school but cargo bikes still fulfill an important role. There are still beaches or museums to be visited, playgrounds to be explored. 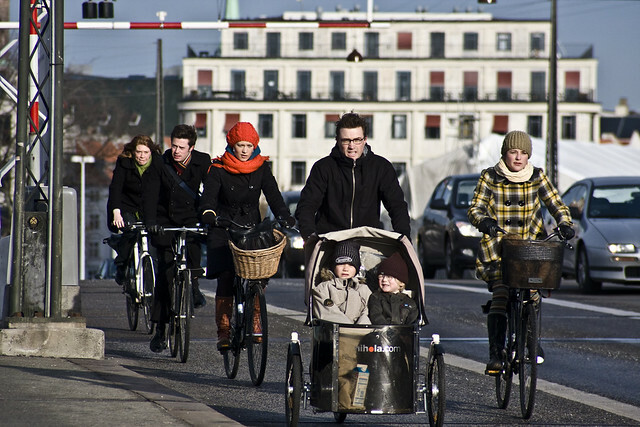 Denmark is one of the countries in the world with the greatest level of gender equality. It's not just in business or politics - out of the eight polictical parties, four have female leaders, including the Prime Minister - but in everyday life. A simple phrase from other societies like "soccer mom", for example, seems rather odd and archaeic. We're just soccer parents. 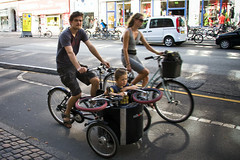 We hear, however, the same thing from cargo bike brands and bike shops. 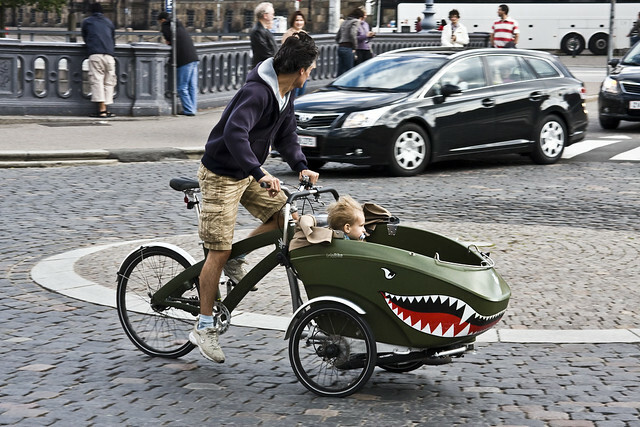 When a young family is discussing getting a cargo bike, it tends to be the mother who calls the shots regarding brand, accessories, etc. 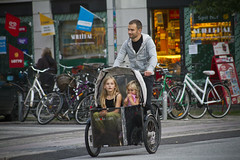 Nevertheless, the bike becomes The Family Bike when it rolls out of the shop, as you can see in this article. 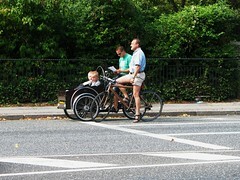 Superdads just getting on with it. 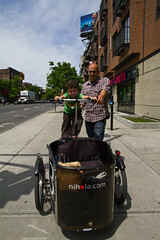 Rolling kids around the city. 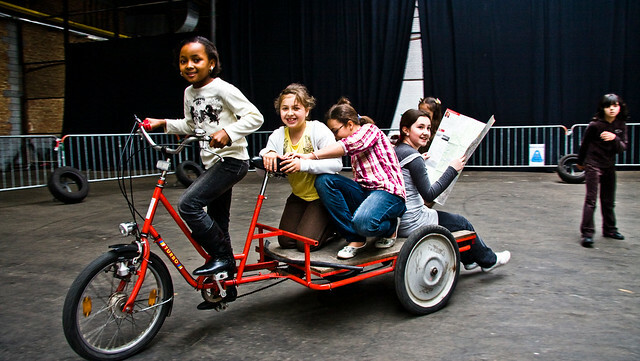 Given our involvement in the European Cyclelogistics project, we have cargo bikes on the brain at the moment here at our offices. So here goes. 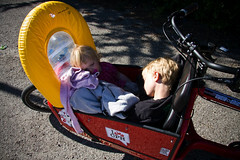 At left: Here are my kids napping on the way home from the beach on our Bullitt. 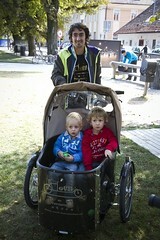 At right: My boy and two friends on our old Longjohn. 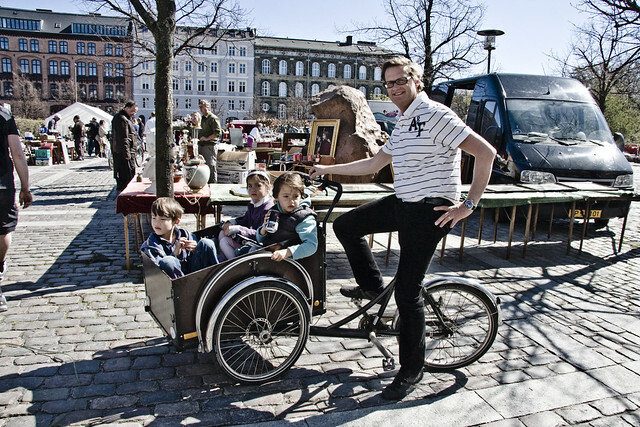 Nihola Bikes do their thang. In Ljubljana and Montreal, too. Bullitts from Larry vs Harry. A no-name brand at left and an Winther Kangaroo at right. 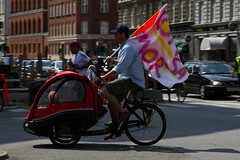 The flag reads "Go, Mum!" 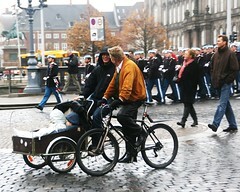 and they were riding alongside his wife as she ran the Copenhagen Marathon. 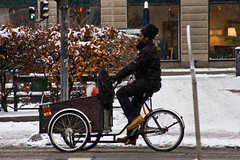 Sorte Jernhest (means Black Iron Horse). The one on the right is available for residents to borrow from various locations around the city. Then again... kids are doin' it for themselves. 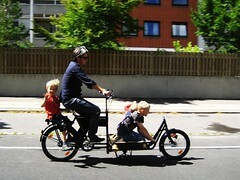 As a Dad to be I'm weighing up the choice between a Bullitt and a triobike. 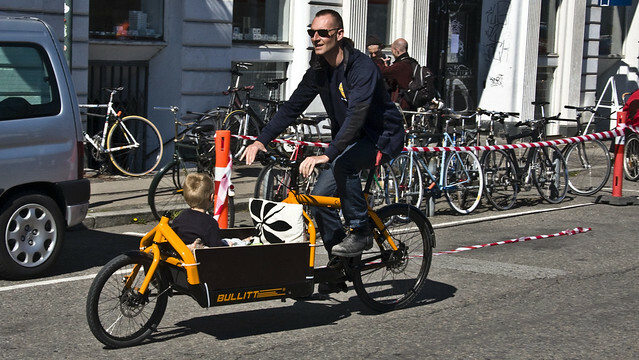 A bullitt looks lighter and a bit easier, more like a regular bike. Anyone got any strong thoughts or advice? 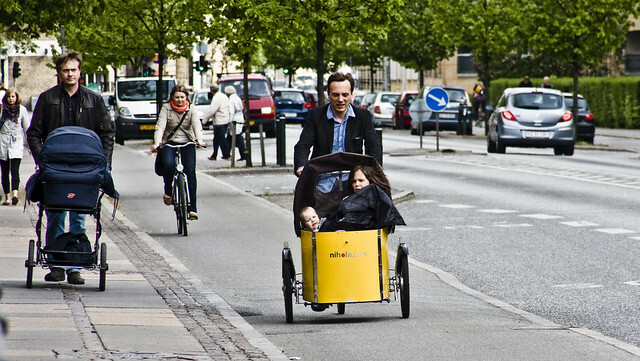 NB I live in London and am trying to avoid having to get a big family car if I can. 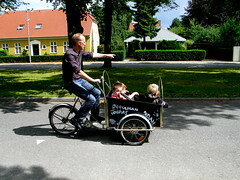 Only knock on the Bullitt is the somewhat high top tube (says the guy who rides a longbike with a somewhat high top tube). 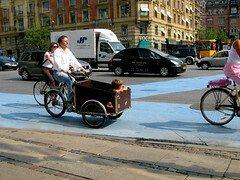 A bicycle is going to give you more ability to corner and fit through tight spaces. 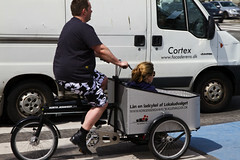 A US option (the cargo bike I might buy if I didn't already own one) is a CETMAcargo. One guy, very busy, with great design sense. The top tube on the Bullitt is low! I usually swing my leg over it to get off and my four year old can straddle it whilst I ride. 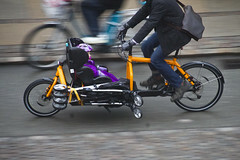 More room in the Triobike, absolutely, but the Bullitt is easier to handle in traffic. Just as wide as a regular bike. Did someone already test the two-wheels from Urban Arrow ? It just looks fantastic. What about the bullit with children ? They show no children accessories on their web site.